The 2015 Byron Bay Property Sales Ocean Swim Classic will be held Sunday 3rd May 2015. Aabi’s at Byron still has several rooms available for the event. 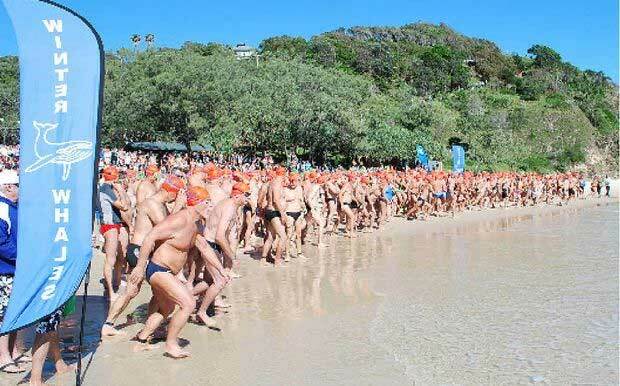 The Byron Bay Property Sales Ocean Swim Classic attracts a broad range of swimmers from throughout Australia. The event has been won by past Olympians including Grant Hackett, Ky Hurst and Melissa Gorman but many, including veterans, gain a huge sense of achievement from completing the course. Since starting in 1988, The Byron Bay Swim Classic has donated $669,000 to selected charities and local organisations. Increasingly swimmers come from further afield to participate in the Swim. Many from south east Queensland (Gold Coast and Brisbane) are joined by swimmers from Sydney and Melbourne. Interstate swimming clubs frequently use the Byron Bay Ocean Swim Classic as an end-of-season opportunity to visit the iconic town.